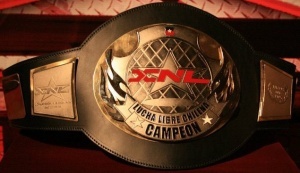 The XNL World Championship is a professional wrestling championship promoted by Xplosion Nacional de Lucha Libre in Chile. The championship was defended all around the world from 2010 to 2012 when Super Crazy was the holder. Mr. Keyton is the current champion. He defeated ____ on March 31, 2019 in Teatro Huemul, Santiago, Metropolitan Region to win the title. On August 29, 2010, the promotion began a tournament in order to crown their inaugural champion. Katástrofe beat Crazy Sid in the finals of first block, while Castigador, and Xtra Large both were placed into the finals as they drew in the final match of the second block. On September 26, 2010 at XNL Independencia 2010, Xtra Large became the first champion by defeating Castigador, and Katástrofe. At XNL Desastre Total 2010, Xtra Large lost the title to Super Crazy, who began to promote the title all over the world. Crazy became the first international wrestler in win the title. XNL announced on March 13, 2011 through their official website (www.xnl.cl) that the XNL Championship was renamed XNL World Championship due to the prestige Super Crazy was giving it internationally in recent dates. In the first defense of world title, Super Crazy defeated Crazy Sid to keep the title. The XNL General Manager Raddon announced the title as vacant on June 16, 2013 due to Xtra Large was unable to defend the title as he suffered a right knee sprain (kayfabe) in a match versus Al-Cold on June 9, 2013. However, on June 23 at XNL Santiago: Capital Del Caos 2013, Ricky Marvin defeated Al-Cold, and the "injured" Xtra Large to win the vacant title. ↑ two falls match, first fall for XNL Title and second fall for X-LAW Junior Heavyweight Title. ↑ title vs title match against Katastrofe's X-LAW Junior Heavyweight Title. ↑ Xtra Large wrestled in the match even though he was injured (kayfabe). ↑ Taylor Wolf left the ring at begin of the match due to a (fake) injury. ↑ Taylor Wolf cashed in his Batalla Real X's title chance to win the championship. ↑ The referee Sergio Catalan hit Al-Cold with the title, helping Taylor Wolf to win back the championship. ↑ Three Stages Of Hell Match. ↑ Sinner cashed in his championship match contract by winning the Batalla Real X 2016. ↑ Sinner cashed in his championship match contract by winning the Batalla Real X 2018.